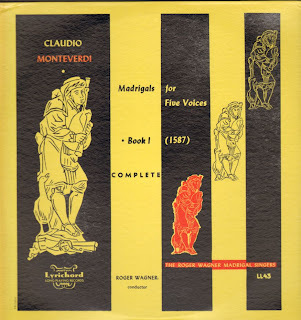 Grumpy’s Classics Cave: Roger Wagner directs Monteverdi Madrigals, 1951? Roger Wagner directs Monteverdi Madrigals, 1951? For some years now I have admired the work of choral director Roger Wagner and everything of his I hear only increases my admiration. Some time ago I posted on various newsgroups my transfer of his lovely Capitol LP of Stephen Foster songs, which I continue to enjoy and delight my friends with (now, if only I could buy the Korean EMI CD reissue or, better still, EMI would reissue more of their Roger Wagner archive in the Western hemisphere!). Next I would like to present his Lyrichord LP of Monteverdi's first Book of Madrigals; as far as I can tell, it is a 1953 reissue of a 1951 origination on Allegro (interestingly, only Side 2 has an Allegro matrix number and sounds distinctly worse than Side 1 - lower level, more noise; they can't have re-recorded Side 1, can they?). The Allegro issue was apparently listed and/or reviewed in two American publications, The Gramophone Shop Supplement in August 1951 and Consumers' Research Bulletin in October '51, neither of which I've seen. My estimate of the recording date is based on these but it could have been earlier. According to http://therogerwagnerchorale.com/history.html the Chorale was signed to Capitol in 1949, but perhaps that contract wasn't exclusive, as I see that in 1951 Allegro brought out an LP of Bach Cantatas with the Chorale. This Monteverdi is a bit of a 'run-through', in places (as many such traversals are), and I'm not sure all stanzas of all the poems are sung (not that I've checked) but it's an amazingly stylish, confident and pretty enjoyable presentation, sung by a small ensemble rather than the large choir one might expect to hear at this time. It was also a time when so much early music was still presented in rag-bag anthologies from widely disparate periods and styles, so this record strikes one as a very serious enterprise. In fact, I wonder if it wasn't the first recording of a complete book of madrigals - does anyone know? One of my usual pretty basic transfers, using ClickRepair: 21 tagged mono FLACs, with a so-so scan of the texts on the back of the sleeve, in one .rar file which can be downloaded from Mediafire here. Still some sonic problems, such as slight blasting on peaks towards the ends of sides and quite a bit of surface swish and swoosh. A friend told me about Waves' Z-noise gizmo and demonstrated it very convincingly on a track from my Mildred Clary lute disc. >Sigh<, another piece of software to buy! Enjoy! You mean besides Ives and Snow White? "Nathalie Wood went on to star as Maria in the 1961 film of West Side Story and though originally signed to do her own singing in the film, Wood's sung numbers were later dubbed over by session singer Marni Nixon." I greatly appreciate the opportunity to hear this. Thanks also for providing as much background context as may be available. As you note, there is some awkward singing here and there, but this sounds more like a lack of rehearsal time than a lack of talent. There is a palpable sense of intimacy in this recording that I found enjoyable. Thanks t-ador, I agree about the intimacy - that's a feature of many earlier Roger Wagner records. I'm sorry I didn't provide more background but I'm lazy and I just wanted to get the music out there!